Who says that sculpture is purely a visual art? We believe that it is in fact a medium that can encompass all the senses (even at the same time.) Today let’s take a look at “sound sculpture”. These are artworks made to create a sound effect via their own composition. Artists often use the different properties of materials to create an echo or touch-sound based on human or environmental interaction. Chimes are a good example of a kinetic sculpture that involves itself with the production of sound art. It uses the wind energy and creates pitch tones by moving into contact with its own metal elements. Sound sculpture was influenced by kinetic sculpture and art cymatics, and exists as an intermedia in the world of art. Some famous artists that practice the art of sound sculpture are Maryanne Amacher, the Baschet Brothers, Hugh Davies and Henry Dagg. Sound can be created in a number of ways. From touch, air, heat, electricity and the other types of energy. What sculptors of this genre seek to learn is the creativity that is fostered when combing the physics of sound with the curiosity of art. In our own contemporary world, Sound sculpture makes up a small portion of the evolving artforms that are slowly making their way into national museums and private galleries across the world. Being inspired by kinetic sculpture means that sound sculptures are largely done using some form of energy. When exploring this type of sculpture, whether for a collection or a hobby, one must always critique the use of energy involved. The rate and type of transfers, the science behind the art, and the ingenuity of the composition. It takes a lot to meld science and art into a hybrid medley of beauty, however if done correctly, it can create a spark for creative innovation in the community. Acrylic is an industrial material that has several visual properties. Its good durability, coupled with its clear and transparent orientation makes it a good candidate for artistic endeavors. Through the years, people have been upgrading technology to make the usage of acrylics suitable to every household artist. Because of the toxicity in its casting process, it wasn’t widely adapted as a media until now. Acrylic was an intriguing material explored by the great Alexander Calder (inventor of the mobiles). Frederick Hart attempted to first cast it in the 1970’s. He joined with Robert Chase, Sr. and formed a company known as Chesley LLC, which was meant to create acrylic sculptures. Hart finally succeeded in 1982 with his piece “Gerontion.” This brought good news to the art community. Clear acrylic sculptures are often coveted for their ability to shape light beams. Similar to the properties of glass, acrylic’s physical properties allow a playful distortion of light to shine through it clear interiors. Many acrylic sculptures have trained for more than several years practicing and mastering these unique traits of the medium. Such artists include Vasa Mihich of Vasa Studios, Paul Sable and Melanie Hope. Colored acrylic sculptures are also a big hit at some places. Shlomi Haziza produces vivid creation of colored acrylic and her works are prized by dozens of patrons coveting her designs. Another artist, Shahrooz Nia has developed a technique for hand-painting acrylic sculptures and giving them the feel of a traditional artwork. Acrylic artists, though in tune with mastery of the media, often report of the difficulty involved with using it. Many galleries that sell pieces made from acrylics offer them at a high price, usually over 2000 US dollars for a standard sized piece. With technological advancements fast approaching, one may wonder if in the future, more and more innovative artworks will be seen in this ever-curious novelty medium. Kinetic refers to something in motion, so this form of sculpture can be defined by its unique aspect of integrating motion into its beauty and function. In some societies, both sound sculpture and light sculpture are also considered as kinetic art, but traditionalists refer to the term only when they pertain to concrete masses in motion. Two popularized examples of kinetic sculpture are the mobile and the fountain. First off, the mobile is a type of kinetic sculpture that makes use of the properties of equal balance. Weight and density are taken into detailed consideration when creating works in this field. Most mobile sculptures have separate elements hanging or balancing by some point of reference. This set of elements are set in motion by a slight force of wind or air current. Alexander Calder is one of the most famous and acclaimed mobile artists of the 19th century and was best known for many of his playful depictions created by crafting metals into mobile sculptures. The mobile is also a very popular teaching exercise used to instruct art students on the aspects of balance and composition. The fountain is a type of kinetic sculpture that associates itself with a flow of liquid. Most common fountains today are used in a grand scale as center pieces in many hotels and resorts, but there are several artists who still practice the creation of solo or small fountains, such as the japanese bonsai-garden sculptors that make use of controlled water flow in their living artworks. The motion-creator for any kinetic sculpture can stem from many different sources of energy, such as wind and water power, electrical power, steam power, mechanical (or human) power, or even using clock work. Historians argue that the very first kinetic sculpture was made by Marcel Duchamp. A piece entitles Bicycle Wheel in the early 19th century. At around the same time (but a bit later), Naum Gabo and Antoine Pevsner created their Realist Manifesto in Moscow. Kinetic art was finally included as a novelty in the compilation. 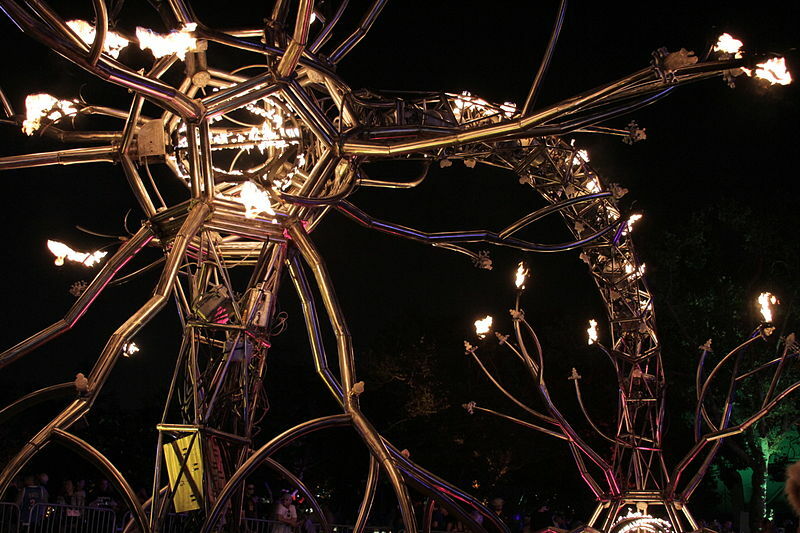 If you would like to find Kinetic Art sculptors you could contact the Kinetic Art Organization or KAO, which is the largest international art organization of its kind.